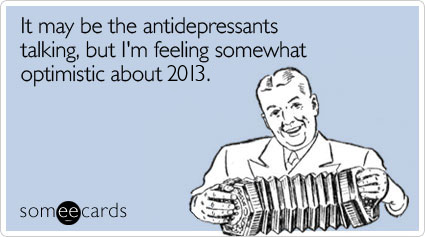 2012 was not the greatest year on record for me, but it wasn't the worst either. I took 2012 as a year to figure some things out for myself along the lines of who, what, why and where I want to be. This was one of the more difficult things I have done because it really forces you to look at all aspects of your life and take accountability for where and why you are where you are. Sometimes the hardest thing to do is realize that you and only you are responsible for how you feel and what you have. It's easy to blame a situation, bad event, crappy luck or a person for where you are, but the truth is at the core of every decision we make it is us (and only ourselves) that makes that decision to be where and what we are. We alone are in charge of our destiny, our joy, our sadness and our life. Some of us chose to live in a state of constant struggle, others take that struggle and turn it in to a drive or passion to be more than a label, a name or a feeling. I like to think that I don't "blame" anyone for my issues and for the most part I am true to that, but every so often I think about how things may have been different if something would have gone differently. The truth of the matter is that even if I could, I wouldn't want to change it. I have worked hard for where I am and I have many blessings in my life. I am not perfect and I will not strive to be, I will just continue to try and be the best person I can be. That is my so called resolution for 2013.